While on a day out to the lovely village Bourton On The Water we decided to visit a few attractions within the village. 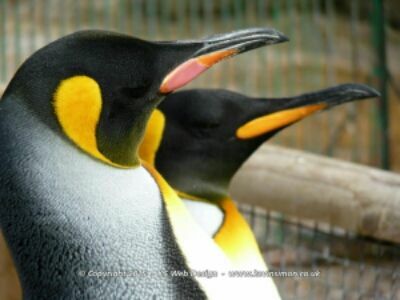 One of the places we visited was the Cotswold Birdland Park and gardens. Entry price is reasonable at £9.95 Adults, Children £6.95, Student or OAP £8.95. Though if you book online before your visit you can save 10%. We had some Tesco Clubcard Exchange days out vouchers (See HERE for details), so for the tree of us we used £20 of days out vouchers so only cost just under £7 to get in. For latest prices and opening time see the official website HERE. Birdland is set around nine acres of woodland and gardens, you can see various birds they include Parrots, Flamingo’s, Penguins, Pelicans, Finches, Touracos, Hornbills, Owls, Cranes, Storks Ostrich, Waterfowl etc. There is also the marsh mouth nature reserve & the Jurassic journey. The first part that you come to is the Penguin shore where you can see the different penguins including the king penguins and Humboldt penguins. We got there just in time for a talk by one of the keepers while he was feeding the youngest p[penguin, that has been hand reared at birdland, called spike, He gets his food first before the other, It was a very interesting talk. You can also see the main feeding which takes place twice a day. Other main parts we enjoyed was looking at the flamingo’s both on the lake and on the river, also as there are several aviaries with various birds to many to mention, but did really enjoy looking at the owls. Also you can get up close to Emu’s and see pelicans in the river. There is also the temperature house and discovery zones which houses, reptiles, spiders tortoises, lizards etc. also loved seeing the rabbits that were running around a penn that you could walk around. with also guinea pigs there aswell. There is also a cafe on site, we didn’t get anything from the cafe so cant say what the prices would be like, though there are picnic areas aswell if you bring your own lunch, remember you can return to birdland throughout the day, just remember to get your hand stamped and you could have a picnic within the main town, this is what we did. We walked around nature reserve and for 2015 now incorporates the Jurassic journey, which has large models of all different dinosaurs around, about 20 in all. Within the reserve there are a few hides just to sit and look at the wildlife. We really did enjoy our time around bird-land, I was a very nice and relaxing visit if you are really interested in birds and bird-life, you could spend all day looking around, for us we spent around 2 hours looking around. Our teenage daughter did enjoy it though she enjoyed the sandpit tables by the cafe even more 🙂 Birdland is good value for money and is a nice place to visit while you are in the village as it is only just under 5mins walk from the centre of the village.